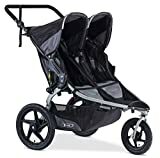 What are the best Jogging Strollers? If you are the type of parent who does daily running exercise but can’t or won’t leave the child behind, a jogging stroller is what you need. These strollers can be a bit expensive (depending on the brand) because they are built for faster moving and for additional safety. What separate a jogging stroller from the traditional stroller at first glance are the wheels of the former. This is because jogging strollers have three large fixed wheels with shocks. Although you can use a traditional four-wheel stroller for your morning jogs, this is not recommended. Unless you’re going on a slow pace, you’ll only run through flat and smooth surfaces, and you won’t put too much pressure onto the stroller, your baby will be fine in a traditional stroller. However, it won’t mean much to you, as you won’t get the full benefits of jogging. If you’re fixed on the idea of taking your child to your jogs, invest in the best jogging stroller. Here we have listed some that could make your search easier. What are the best-rated jogging strollers? This jogging stroller is made wit aluminum frames for lightweight and easier handling. The fabric is made of polyester and is strong enough to carry the weight of a child up to 50 pounds. The three wheels come with 16-inch thick, quick-release aluminum rims with spokes. You’ll be able to set or manual lock the front wheel for easy swivel. For your entertainment, it comes with canopy-mounted speakers that accept most MP3 players. Underneath the baby seat has a mesh container that can house both your and your baby’s needs. The wheels of this jogging stroller are made of pneumatic bicycle-style tires that can handle all terrain and outdoor situations. It hind wheels are measured 16” while the locking front swivel wheel measures 12”. It has two trays, both for the parent and the child, which can hold two cups. While you are running, your baby can rest comfortably because of the padded multi-position reclining seat that can carry the weight of a child up to 50 pounds. Despite the terrain and the miles you have run, this jogging stroller endures for years. For the price, it’s a good buy. Parents on the go would definitely enjoy running with this jogging stroller because its air-filled rubber tires gives your child a smooth ride despite the terrain. The front locking swivel wheel also provides easy transition from strolling to jogging. The seat is padded with deluxe material and is multi-position reclining to give comfort to your child. Below the seat you’ll find an extra large storage bag to fit the needs of your baby. The parent tray comes with two cupholders while the child tray can contain your child’s snacks. The Graco FastAction stroller also has a convenient one-second fold for effortless opening and closing. 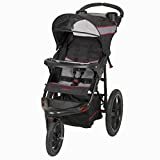 This jogging stroller has 12” front and 16” rear pneumatic air tires that has molded rims to provide maximum performance. It has trays for both parent and child, each coming with dual cup holders and molded trays to fit sippy cups, milk bottles, and snacks. The front tire allows for manual locking, making it easier for swiveling. The comfortable, padded seat also comes with a car seat adapter that allows for use with different car seat brands. The handle grip is rubberized for slip-resistant comfort and it has a dual trigger folding system for additional safety. 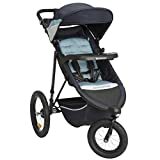 This jogging stroller comes in four neutral color choices with wheels featuring a state-of-the-art adjustable suspension system for an excellent smooth ride. Parents won’t have to worry about maneuverability because the tires are capable of increased stability on rough terrains. Your child will bask in the comfort of his seat because it is ultra-padded and adjustable for reclining. It also has a five-point padding harness that keeps the child secure. The BOB jogging stroller also comes with several containers: two interior pockets, a seat-back pocket, and a hanging basket underneath. Stability – A well-balanced stroller is what you need when going for long runs as it makes the run not only safe for both you and your child. There needs to be even distribution in the weight of the stroller so that when the child moves and turns, the stroller can easily handle the movements. Front Wheel – Jogging strollers always have a single front wheel that can be locked into a straight-ahead position or free to swivel. During running, the best one to use is to set it straight so that even the wheel gets on rough terrain, you won’t have to worry about the stroller losing balance. Locking the front wheel is the safest thing to do when going for high-speed runs. Handle Height – Consider getting the best handle height depending on your height. You want to maintain a good posture while running and at the same time pushing the stroller. Lower handle heights can make you lean forwards, which isn’t good for your back. Hand brake – This feature is an additional safety when it comes to running with a stroller. It enables the parent to slow down the movement of the stroller when going down a slope and not act as the brake of the stroller, which can have an effect to your running form. Key Takeaway: The main things that you should consider when choosing the best jogging stroller is the safety, comfort, and ease it brings you. It should be safe enough for both you and your child when you do high-speed running and at the same time it should provide comfort for both of you. The best jogging stroller should be able to help you out in running and not burden you. If you feel like the jogging stroller is ruining the integrity of your running form, then you may be using the wrong stroller or you’re pushing it the wrong way. Make sure to test out jogging strollers first to ensure that it will work for you and your child.